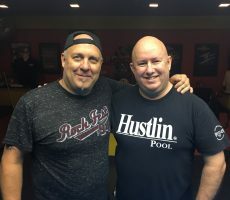 9 BALL HIGH ROLLER REPORT : DAVE BROOKS WINS. FRIDAY 3rd and SATURDAY 4th NOVEMBER. 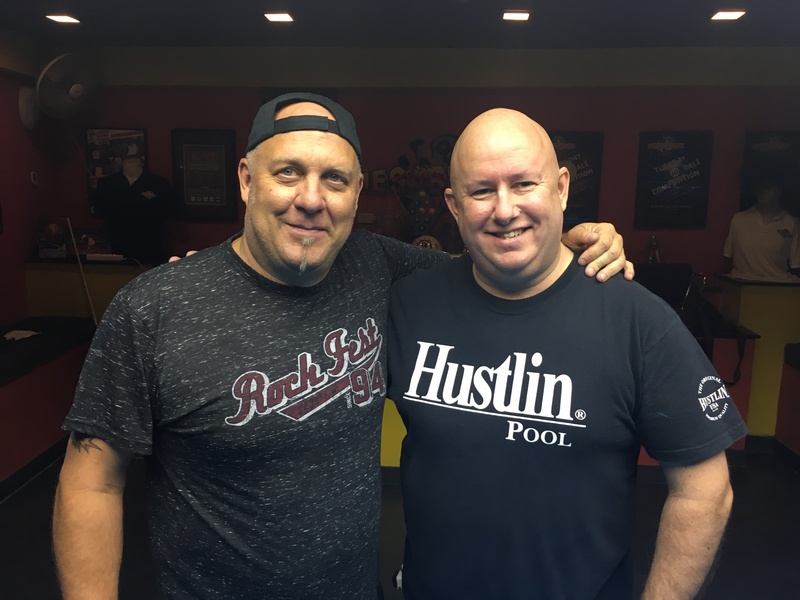 Congratulations go to England’s Dave Brooks for winning our 9 Ball High Roller Competition last weekend. Dave, a regular customer at Megabreak for many years, played consistently well all weekend to lift the trophy in the early hours of Sunday morning. 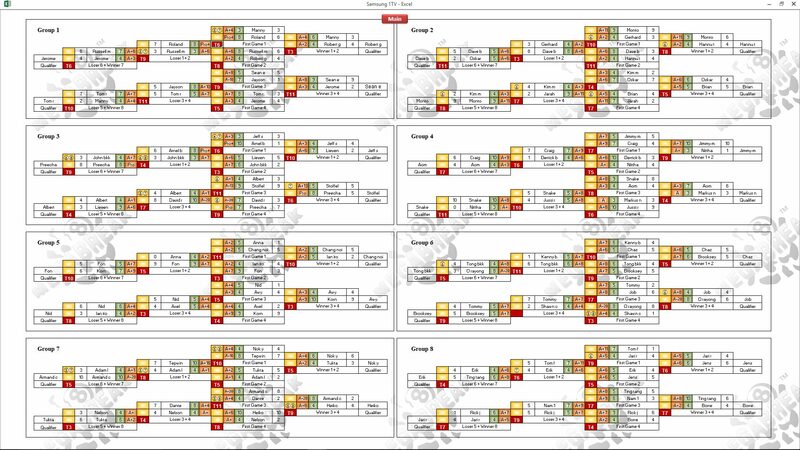 The event was our biggest ever in recent history, attracting the maximum field of 64 entries, and was dominated by players at the lower end of the handicap scale, with virtually all the high handicappers failing to come to terms with the extremely tough handicap system. 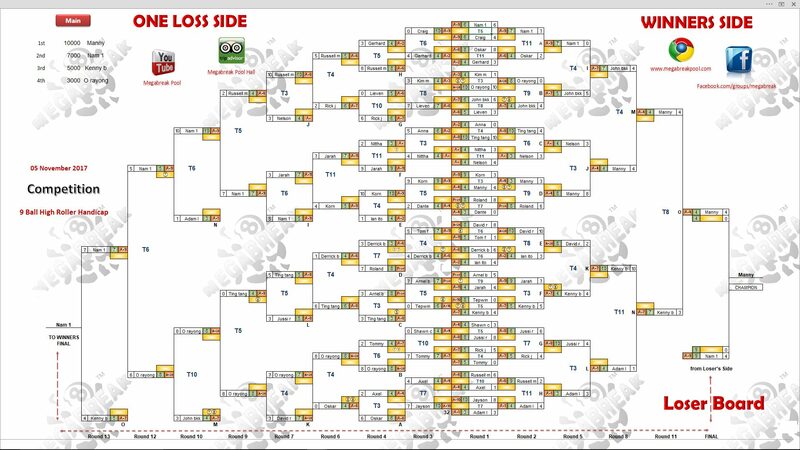 Dave lost his very first match on Day 1 in the Double Elimination Group Stages, before winning his next two matches to qualify for the Last 32 Main Event on the second day. 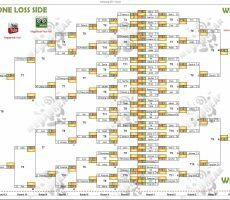 Onto Day 2 and he won his first four matches to put himself in the Winners Side Final, where he would lose out in the deciding rack to eventual Runner-Up Jeff Schmitt from The USA. 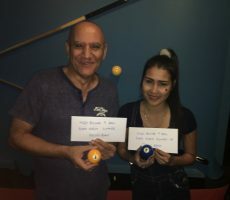 From there Dave moved to the One Loss Side of the draw to play Aom Nantaporn Chomthaisong from Thailand, and he beat her in the deciding game by 7 racks to 3 (race 7-4). 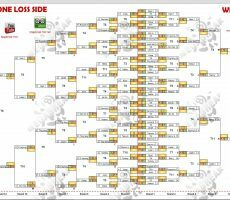 Onto the Grand Final now and with Jeff being undefeated so far, Dave would have to beat him twice to become champion. He got off to a great start in the first set to take a 4-0 and 5-1 lead and ended up winning 7-2. The second and deciding set was initially much closer with the game being tied at 2-2 after 4 racks. 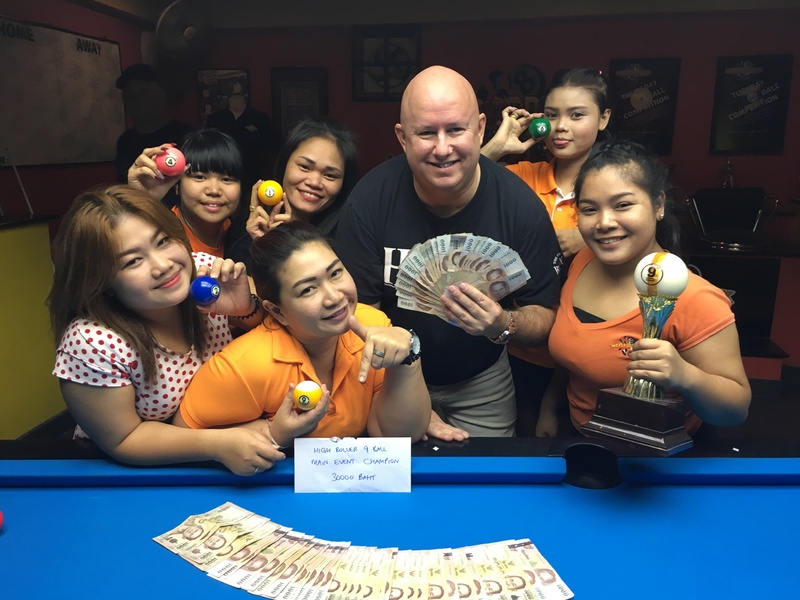 From there Dave would win five consecutive racks to seal another 7-2 victory and collect the 1st Prize of 30000 baht. Over the two days Dave played consistently well and ended up a very worthy winner. 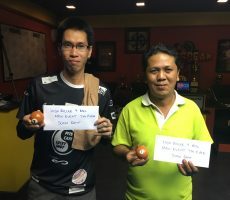 Jeff also played very well throughout, winning 7 consecutive matches to reach the final before just coming up short against Dave, and received 20000 baht in 2nd Place. 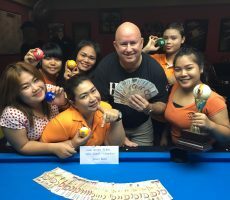 Champion : Dave Brooks (A+6) – 30000 baht. 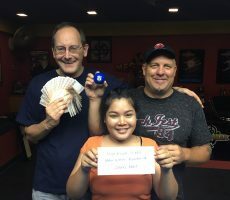 Runner-Up : Jeff Schmitt (A+3) – 20000 baht. 3rd Place : Aom Nantaporn Chomthaisong (A+3) – 14000 baht. 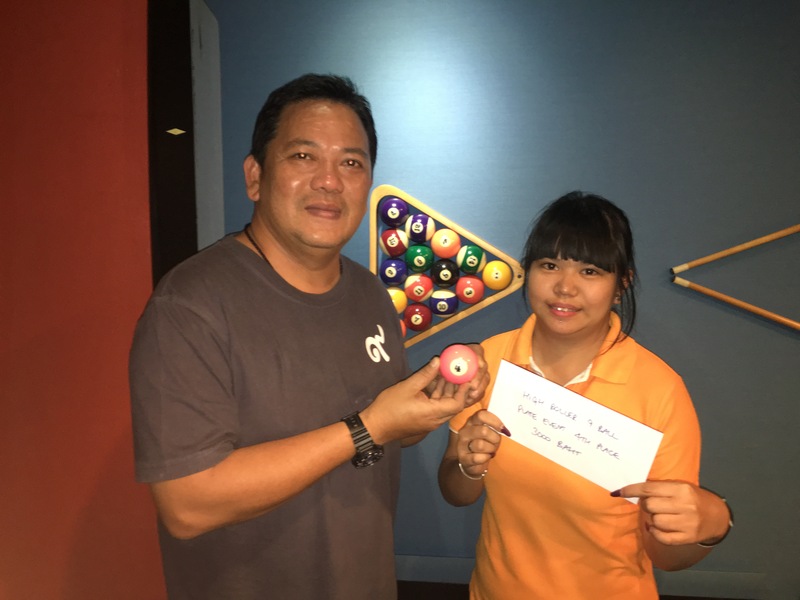 4th Place : Chang Noi Matt Pollard (A+2) – 10000 baht. Equal 5th Place : Tong (A+8) and Fon (A+7) – 8000 baht each. 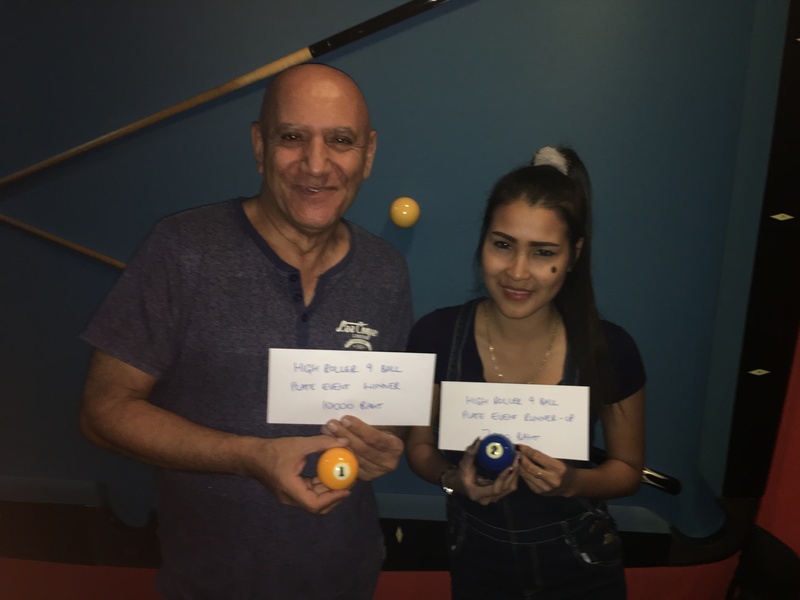 Equal 7th Place : Preecha (Pro) and Job Saran Sangiempansiri (A+8) – 5000 baht each. 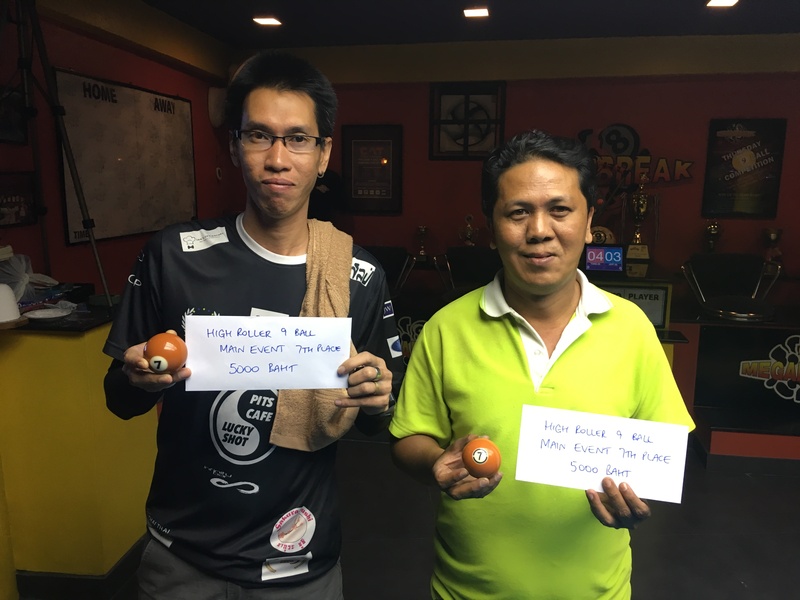 The Player Auction provided enormous extra interest over the two days, creating the biggest ever Prize Pool in Thailand at a staggering 214000 baht!! 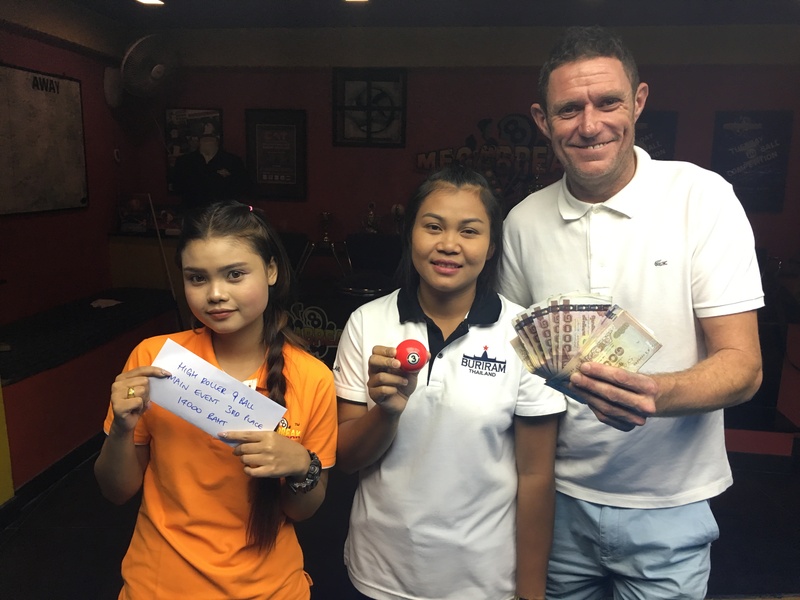 Olly Downey from England was the winner, paying only 3750 baht to buy Dave, and collecting the massive 1st Payout of 75000!! 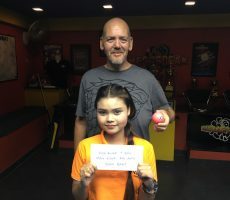 In 2nd Place was Gerhard Schebler from Germany, who paid just 3000 baht to get Jeff, and took home 43000. 1st (35%) : Olly (Dave) – 75000 baht. 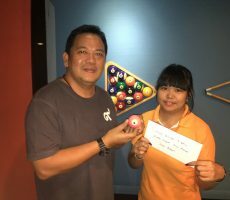 2nd (20%) : Gerhard (Jeff) – 43000 baht. 3rd (15%) : Charlie Ayres (Aom) – 32000 baht. 4th (10%) : Jens Matzel (Chang Noi) – 21200 baht. 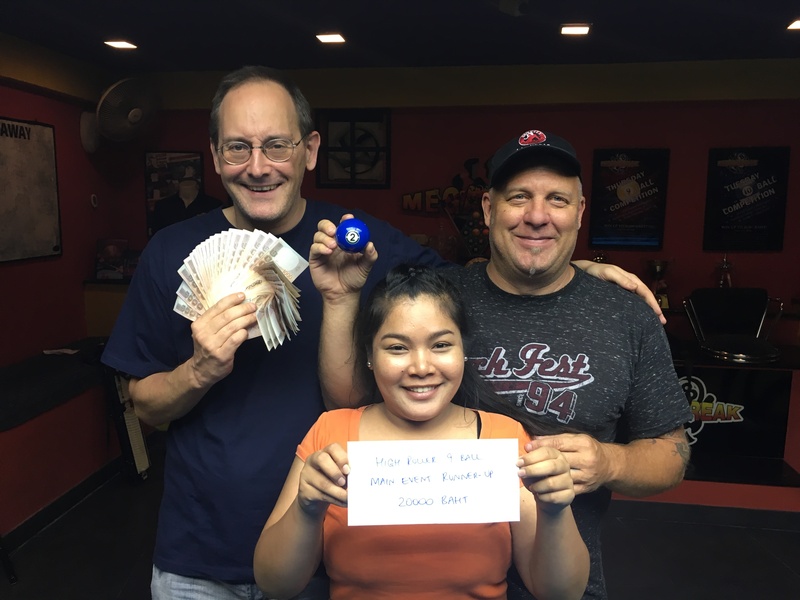 Equal 5th (6%) : Jeff Schmitt (Tong) and Russell Masciotti (Fon) – 12800 baht each. 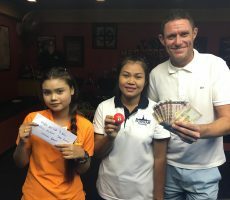 Equal 7th (4%) : Scott Cooney (Preecha) and Dave Brooks (Job) – 8600 baht each. 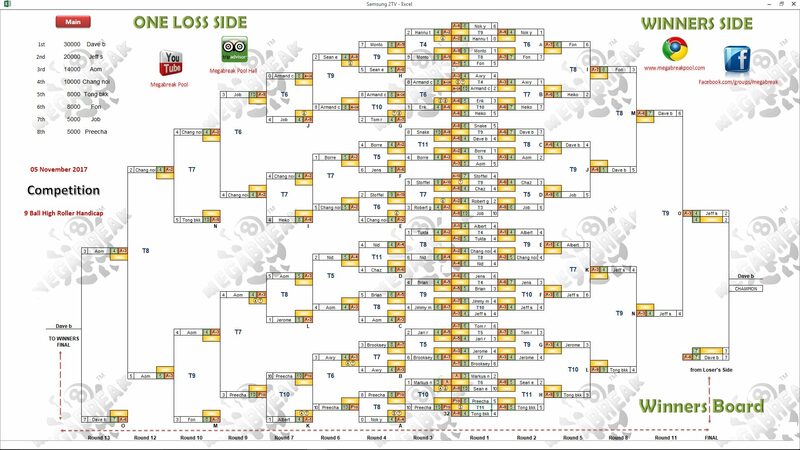 The 32 non-qualifiers from the Group Stages on Day 1 fought out the consolation Plate Event on Day 2. 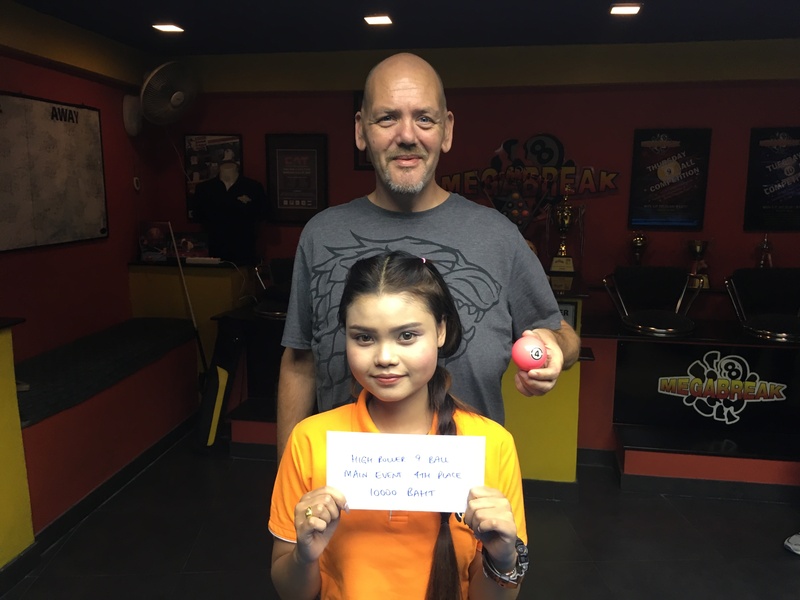 This was won by Manny Raz from The USA, who beat Nam Pennipa Nakjui from Thailand in the final to take home the 1st Prize of 10000 baht. Nam collected 7000 baht in 2nd. 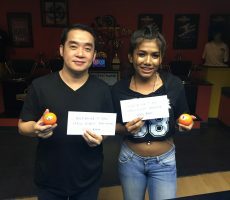 Winner : Manny (A+4) – 10000 baht. 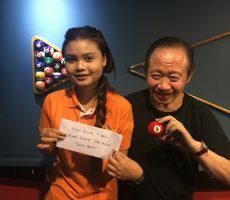 Runner-Up : Nam (A+9) – 7000 baht. 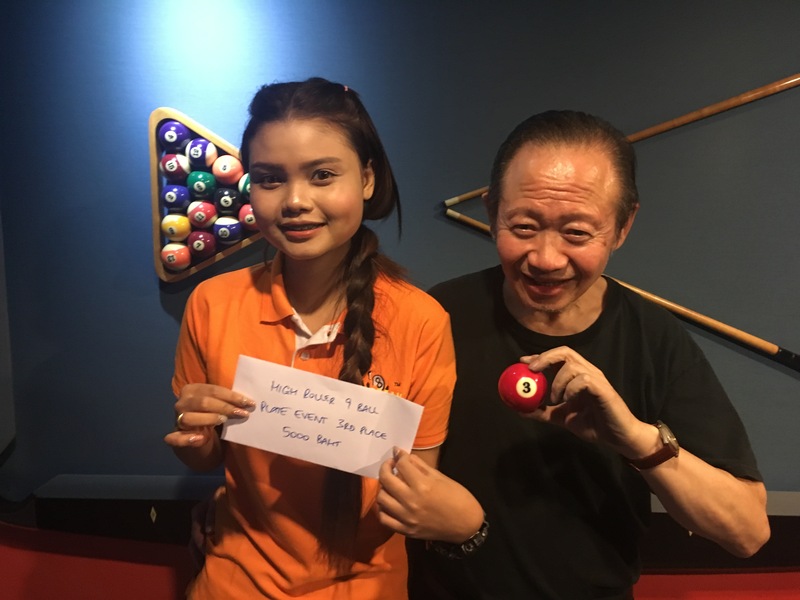 3rd Place : Kenny Wong (A+7) – 5000 baht. 4th Place : O Rayong (A+20) – 3000 baht. Megabreak would like to take this opportunity to thank all the players, staff, and helpers for once again making this event a huge success. PLEASE NOTE : We have not set a date for our next High Roller event yet, but we hope to finalize one soon for a weekend in January 2018.